An original starter of duck wrapped in brick pastry served on a bed of baby spinach leaves and preserved lemon. Cut the brisk pastry sheets in to strips of 4. Drizzle a little olive oil on to each strip. Cut the slices of duck breast in half and place each half at the end of one strip of pastry. Season with salt and piment d'Espelette and then roll the pastry around the duck. Grill or oven bake for 2 minutes at 240°C. Cut the preserved lemon in to small dice. Roughly chop the capers. Mix the lemon and the capers with the parmesan and the olive oil. Add this dressing to the baby spinach leaves and mix. 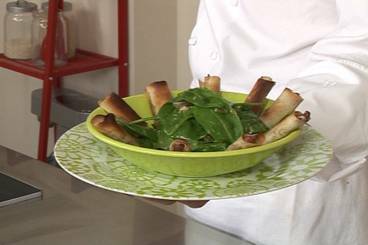 Serve the crispy duck parcels on a bed of baby spinach leaves with lemon and capers.